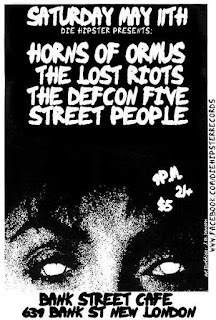 A dope punk show is coming to New London on Saturday. 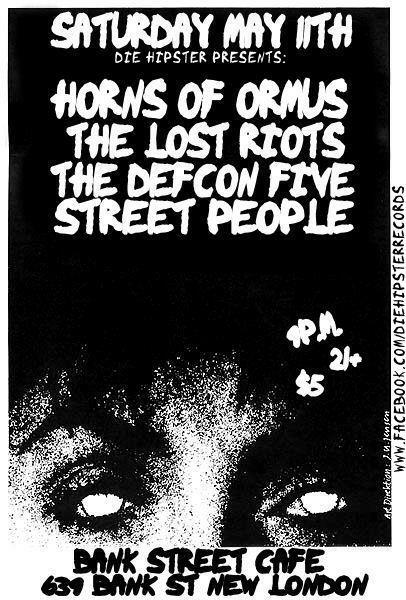 Horns of Ormus, The Lost Riots, The Defcon Five and Street People are coming to Bank Street Cafe with amps cranked and crinkled faces. Equal parts punk and garage with a very 1977 sound. One fan said "they are a combination of The Replacements and Black Flag". There are few bands who can call themselves The Greatest Band in the History of Rock N Roll, The Defcon Five is one of them. From out of the musical wasteland that was 2002 sprang forth four virile rock gods who beat their instruments senseless for the crowd's amusement. Deafening cheers followed them wherever they went! After a good run they were forced to take a hiatus because the rock n roll lifestyle was tearing them apart at a sub-atomic level, but in 2011 they returned to continue their reign! Who are these wonderful creatures, you ask…well they are Live Mike on pulsating throat noises and hip gyrations that make the ladies swoon, Brett Rules on the six stringed implement of Rock N Roll Death, Moe Porne on aggressive bucket banging and sincerely genuine ironic t-shirts, and Sean Lewis on the five-stringed-though-he-only-uses-four low end brown note contraption and figuring out ways to use the term "YEAH!" in songs (it's an easy job, but somebody has to do it)! The Defcon Five was gone, but now they're back and they brought a clipboard and plenty of paper and are going to take names!